Real Madrid on the verge of signing Chelsea star? Hazard off to Real Madrid? Real Madrid are reportedly on the cusp of sealing an agreement to sign Eden Hazard from Chelsea during the forthcoming summer transfer window. The Belgian is presently in his seventh season with the Blues, but his future with the club remains doubtful with his contract expiring at the end of next term. According to Marca, the outgoing European champions are said to have made progress towards finalising a deal for the attacker and the same could be announced before the end of the season itself. 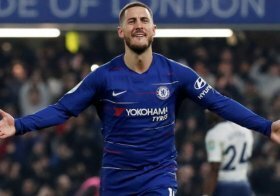 It is added that Hazard is prepared to sign a six-year contract with the Bernabeu giants, once the club can reach an agreement over the transfer sum with the Blues. Hazard is currently enjoying his most productive season in the Premier League, and he has contributed 14 goals and 12 assists for the west London side from 31 appearances. He has previously talked up the prospect of joining Real Madrid and he remains highly-rated by Zidane, who has tracked his progress since his playing days at Lille.